Merry belated Christmas! I hope you are enjoying a long, relaxing weekend after the frenzy of shopping, cooking, baking and planning. I was torn whether or not to post this recipe. On one hand, the pictures looked terrific when I came across this recipe in Bon Appetit back in 2011, on the other, the amount of work it took to make them squelched any desire to attempt it. For Christmas, I finally bit the bullet and went for it. Not going to lie, these were a lot of work spread out over two days. There is quite a bit of time for things to chill and set in between steps and the reaction they received from my husband and even myself was lukewarm. They were good, but we both agreed it wasn’t worth the effort. 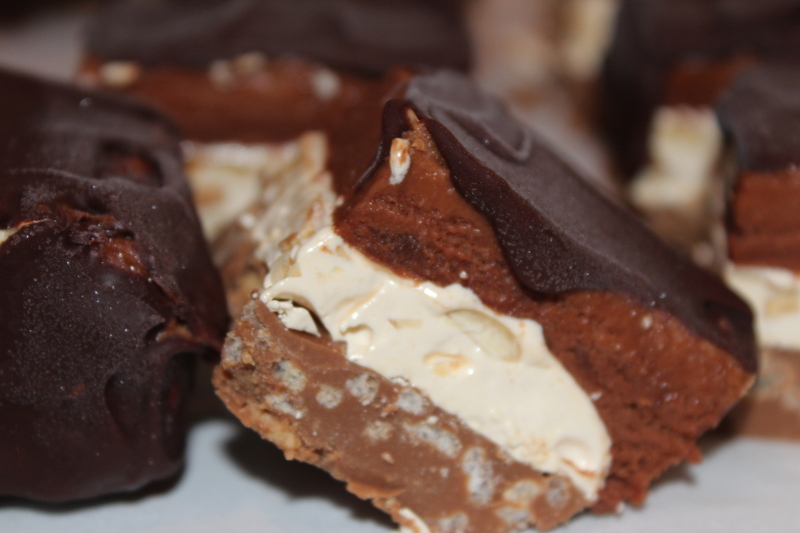 If you or someone you love dearly is a huge fan of Snickers then I say save this recipe for a special occasion, such as Valentine’s Day and knock yourself out. Otherwise, don’t bother. I did all the leg work here so I feel the need to explain the steps for those of you that like a challenge. Coat an 8x8x2 baking pan with nonstick spray, line with plastic wrap or parchment paper pressing to smooth out any wrinkles. Place chocolate in a medium bowl; set over a saucepan of simmering water and stir until chocolate is melted. Stir in peanut butter, then cereal. Press over bottom of prepared pan. Cover; chill for 1 hour in fridge. Line another 8×8 (I only had a 9×9, but made it work) with parchment and coat with nonstick spray. 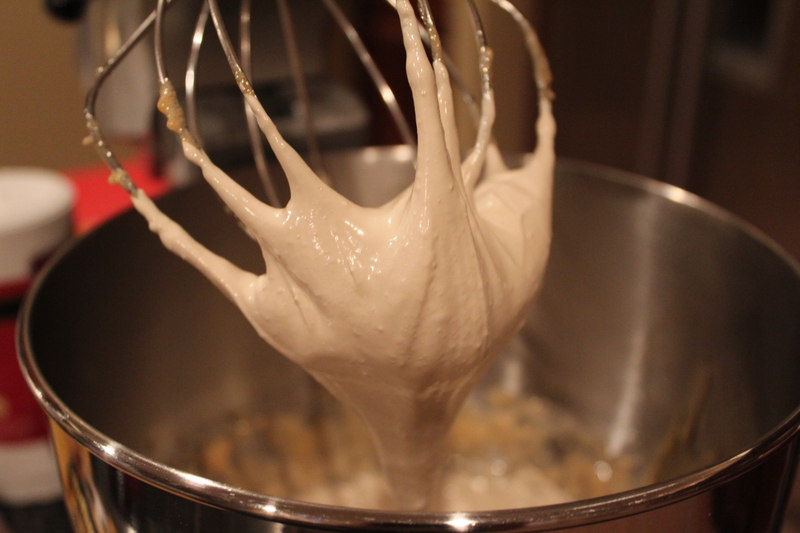 Place egg white in a bowl of a stand mixer fitted with a whisk attachment. Beat on medium speed until frothy. Add 1/8 tsp sugar; beat until frothy. Bring honey to a boil in a saucepan. With mixer running, gradually add honey to egg white. Set aside. Return mixer with egg white to medium speed. Gradually add syrup to egg white, allowing it to drip down the sides of the bowl. Beat until glossy and stiff, about 5 minutes. Fold in peanuts and salt. 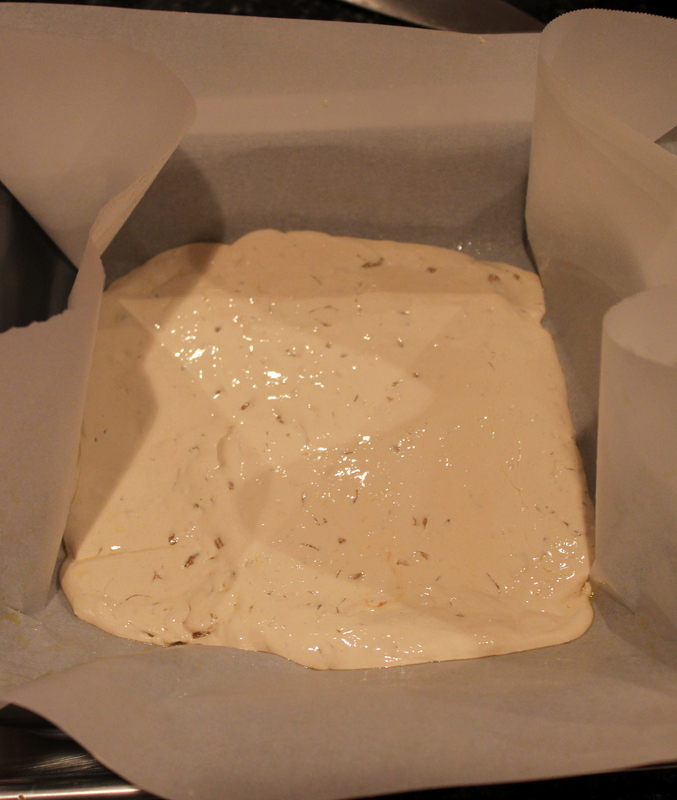 Spread nougat over prepared pan with parchment (Not the one chilling in the fridge). Spread it in an even layer and let cool for 1 hour. Invert nougat over base in pan; peel off parchment. Spread over base in even layer. Place 2 Tb milk in a small bowl. Sprinkle gelatin over; let stand to soften, about 10 minutes. Meanwhile, bring remaining 2 Tb milk and 1/4 cup cream to a simmer in a small saucepan. Whisk yolks and sugar in medium bowl; gradually whisk in hot cream mixture. Return to same pan. Stir over medium-low heat until thickened and a thermometer registers 175 degrees, about 3 minutes. Add gelatin; whisk until dissolved. Place melted chocolate in another medium bowl. Pour cream mixture through a strainer into chocolate; whisk until smooth. Beat remaining 3/4 cup chilled cream in a small bowl until soft peaks form. Fold into chocolate mixture in 2 additions. 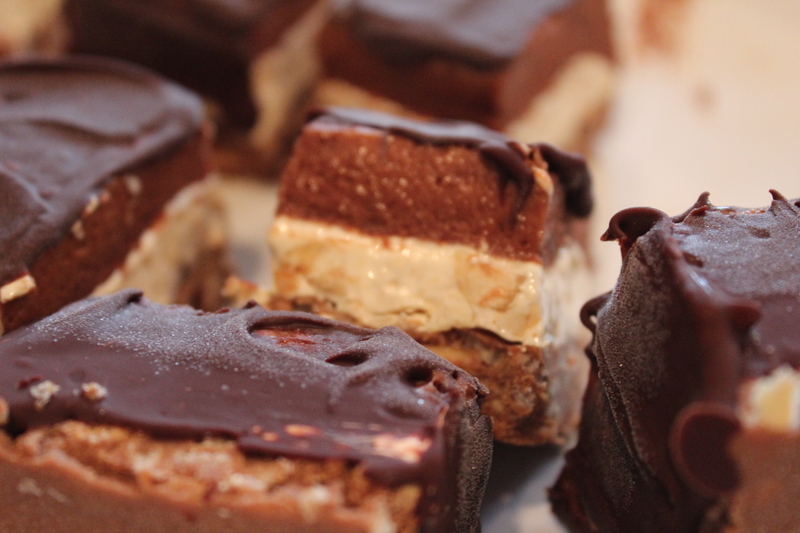 Pour Bavarian cream over nougat, spreading in an even layer. Freeze until firm, about 4 hours. Place chocolate and butter in a bowl set over medium saucepan of simmering water. Stir until melted. Line a baking sheet with parchment paper. Invert 8″ pan on a work surface; remove pan and peel off plastic/parchment. Cut into 6 slices and halve each slice. 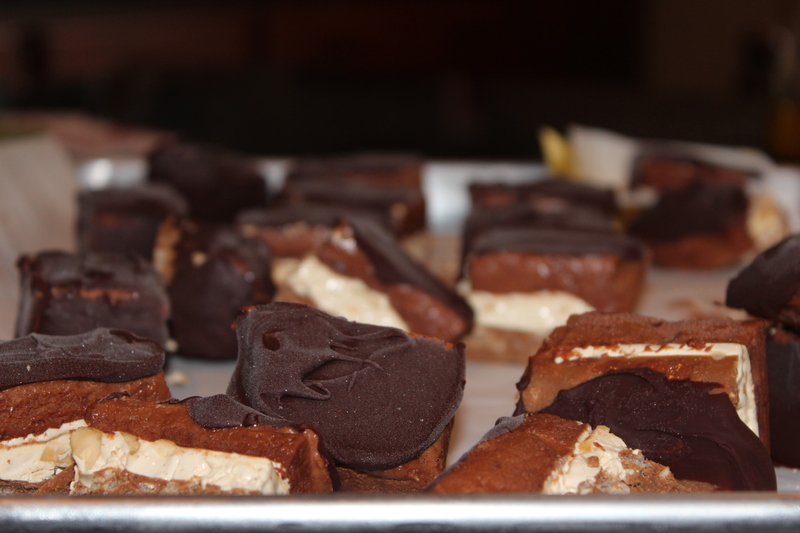 We halved them again because these bars are extremely rich. Using an offset spatula spread chocolate over top. Freeze to set, 30 minutes. You can make these 3 days in advance and keep frozen until ready to eat. Let stand at room temperature for 15 minutes before serving. Looking back on this recipe I am wondering what the hell I was thinking! This is insane; especially trying it in the month of December! Oh well. I like to go big for special occasions and I learned a lot. My first time making Bavarian Cream and it was a success. 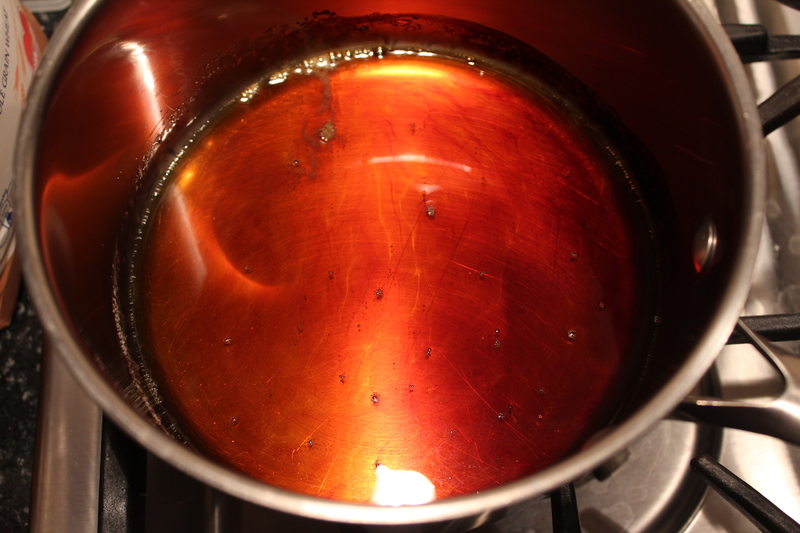 Here’s what you DON’T want your nougat base to look like when boiling your sugar. Too dark. The result, when you do it correctly, is a fluffy, light mixture. 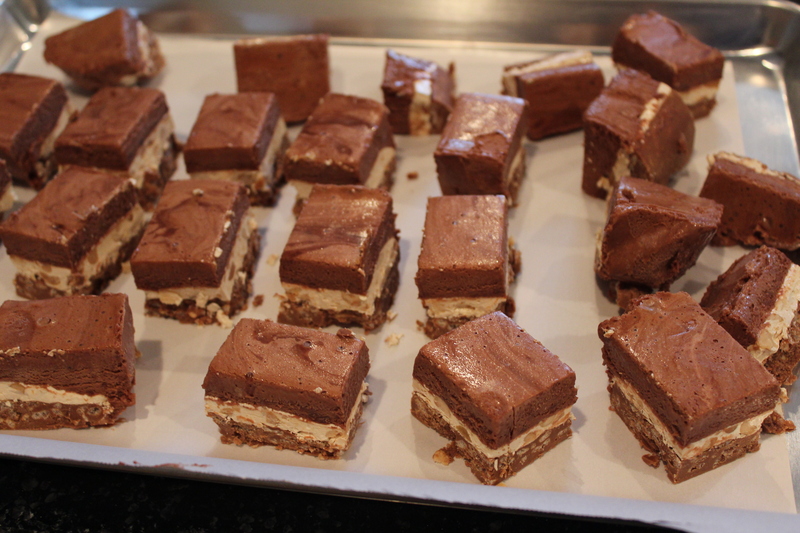 The bars before you add the final chocolate layer. You know you want to try a bite.